The careful manufacturing process is at the core of the value of Tropical dials: in theory such a thing as a faded black dial should never exist. The production of luxury-watch components is highly engineered. Every variable in the production plant is gauged, controlled and recorded to a fanatical degree of detail. The temperature and humidity of the factory, the viscosity of the paint, the density of the pigment in the binder: all are codified to try to avoid variations from one batch of dials to the next. This is similar to rare postage stamps, where “Errors, Freaks and Oddities” often command hundreds of thousands of pounds, simply because the government printers responsible for their production don’t often get it wrong. The technical reason that dials go tropical is simple: the pigment in their paint gets oxidized, becoming bleached. This is likely something to do with exposure to UV light. However, because the pigment is dense and opaque, the UV can’t penetrate very far at once. Not all molecules will oxidize lighter. Some will go darker, and some will be inert — only when an available molecule has been bleached can UV light penetrate to reach the one beyond it, and so on, imperceptibly, layer by layer. This slow rate of color change is what makes the final effect so beautiful, full of depth and subtlety. Here I’m reminded of the subtle flavors that develop very slowly in an old malt whisky versus the reek of a brand-new caramel-tinted rye. 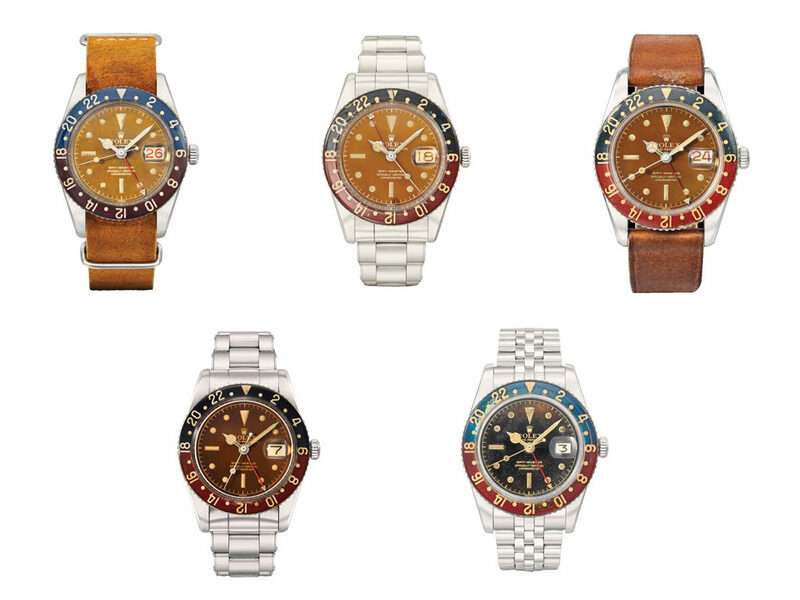 All of these “6542” Rolex GMT-Masters are from 1958, except the last one which is a year younger; notice the variety in color change despite their similar age. Do all tropical dials come from the same batches of production? Were they all even made by the same company? There are certainly dial aberrations that come from a single producer, if not a single batch. In 2007, I published an article in The Horological Journal, first identifying what are now jocularly called “spider dials”. These have become full of craquelure, covered in a crazy paving of fine cracks. Identical effects have been seen on dials from the same period across different brands. It’s not far-fetched to believe that certain batches of dials will be more prone to going tropical than others. Would they have gone tropical no matter what life they led? I have read in auction catalogs and reports in blogs about one or other watch with a tropical dial, whose owner apparently swears that he spent his life in a hot climate, or at sea, or wherever. But just because his dial went tropical, doesn’t mean that all watches that live a similar life will go the same way. 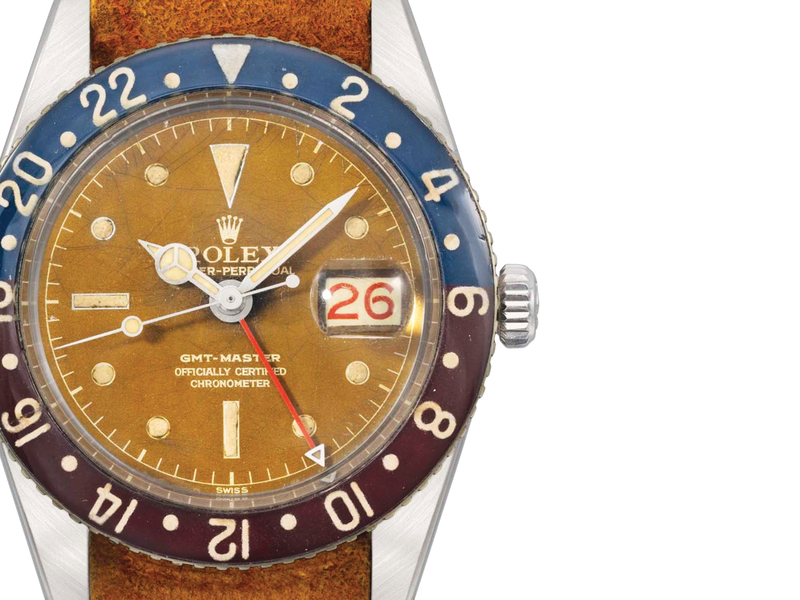 There are thousands of old Rolex Submariners that have spent their lives surveying vast tracts of 20th-century wilderness, or on the deck of a yacht, and which show absolutely no signs of discoloration. Yet others have wildly metamorphosed from their original jet black to the identical shade of tan as those girls sitting at the prow of the yacht. When combined with craquelure, the tropical effect can be particularly beautiful, as in this early Submariner from 1959 (left). 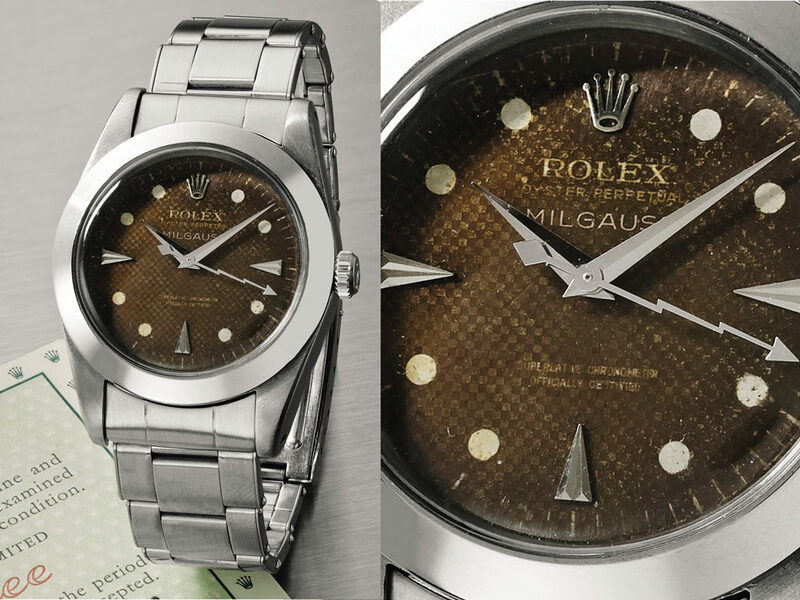 The bezel, however, has only faded slightly, and not changed color; dial AND Bezel on this 1980s Sea-Dweller (center) have equally discolored; don’t be fooled, the brown color of this GMT (right) dial and bezel are factory originals. As with so many other questions in the world of watch collecting, we may simply never know why. Dial manufacturers, where extant, are unlikely to release any official information about the processes used on a given batch of dials. Neither can we now, decades on, start a proper study of the subject using an accurate control sample, because, even if apparently perfect to the eye, the control will have aged in an unknown way over its life, totally skewing any possible results. Tropical, and the added value that flows from it, is not something you can measure empirically, like the number of jewels in the movement, or how many examples were made. It is measured by the imponderable aesthetic sensitivity of the watch collector, which I warrant by more than 20 years’ experience, is of the most nuanced and subtle as can be found in any field. The unpredictability of this beauty is the reason that collectors revere these rare dials so highly. Such artefacts take on lives of their own, enticing us with their independence, like a bonsai tree that may be encouraged, nurtured, and cared for, but whose eventual outcome cannot be known — only prized and admired. When combined with a textured effect, like the honeycomb surface of this Rolex Milgauss, the tropical effect attains its most beautiful state.